American Heritage, a hardcover quarterly, was my favourite magazine in the 960s for its beautifully printed historical paintings, drawings, photographs and antique artefacts. I was impressed, too, by the faux-vintage material created for National Lampoon in the 1970s. 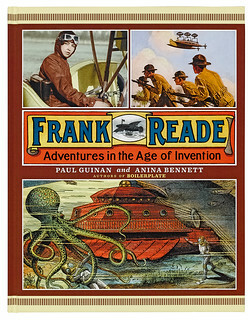 Now, if you combine the artefact-ness of one with the comic-ness of the other, and add a touch of steampunk-ness, you get Frank Reade: Adventures in the Age of Invention by Paul Guinan and Anina Bennett (Abrams Image, £15.99). Frank Reade first appeared in print in the Boys of New York magazine in 1878. This brilliant and total recreation of gilded-age dime novels offers doctored historical photos, off-register colour illustrations and chromolithographic posters so typographically pitch-perfect they are undetectable as fakes. The sheer number boggles the mind. 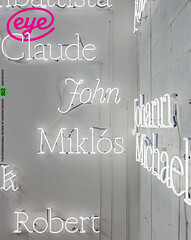 Each is astonishingly work-intensive – each a gem of ironic pastiche. So real are the artefacts Guinan and Bennett have created that the reader will be hard pressed to believe that their globetrotting inventor hero – whose exploits with flying boats, airships, submarines and steam-powered horses are chronicled in woodcuts and comics – is entirely fictional. In Guinan and Bennett’s pseudo-history, Reade is as ubiquitous as Woody Allen’s Zelig, clashing with Arabs and Indians, Asian hordes and African tribesmen, as well as wild animals, large and small, furry and reptilian. What a life. The designers – Martin Venezky’s Appetite Engineers – and authors must have had endless pleasure bringing this fantasy to vivid life. Thank heavens for Photoshop. And the heavens are where, as a steampunk connoisseur, I am with Frank Reade. 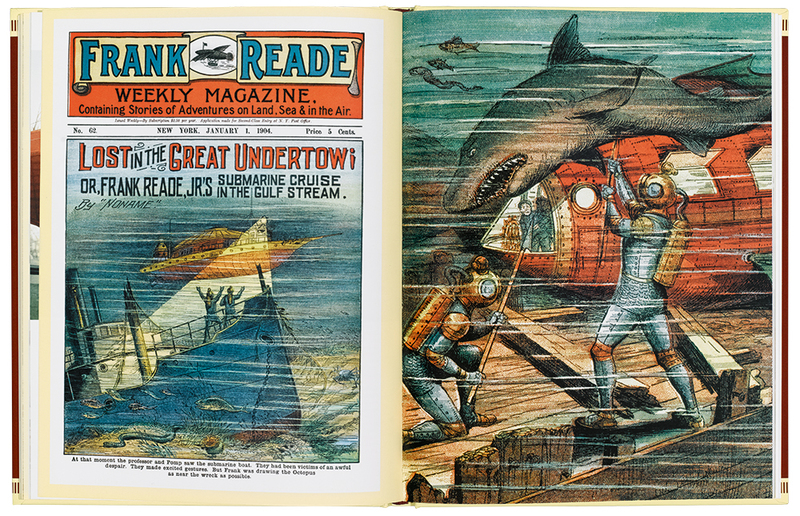 Top and below: Cover and spread of Frank Reade: Adventures from the Age of Invention.